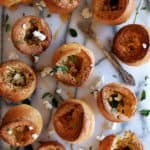 These Herb & Goat Cheese Popovers are airy, cheesy, and full of fresh herbs…the perfect bite for a festive appetizer! I’ve had these popovers in my back pocket for a full month now! I made them around the first of the year when I had New Year’s appetizers on my mind. 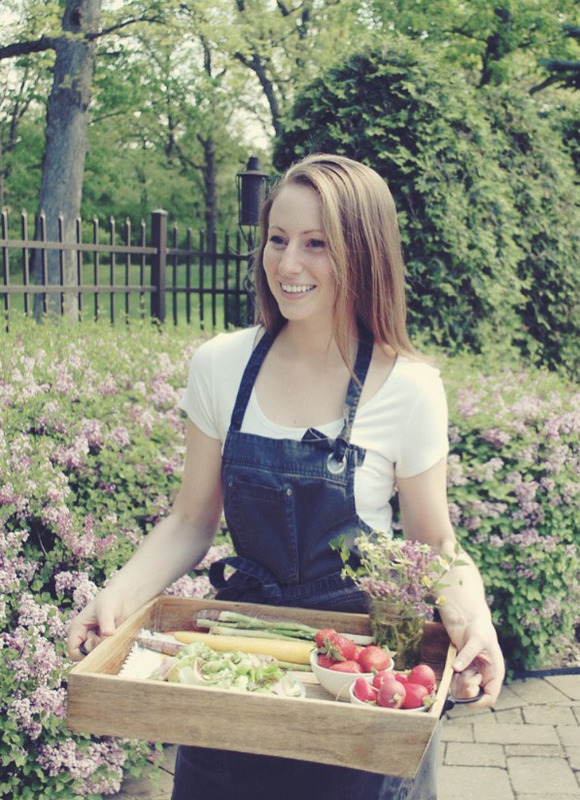 Time sure does fly, but I am so excited to finally be sharing this recipe with you guys. I wouldn’t exactly call these the perfect game day bite (can you believe that the Super Bowl is already on Sunday!? ), but they definitely work if you want something a little bit more sophisticated to add to your spread. 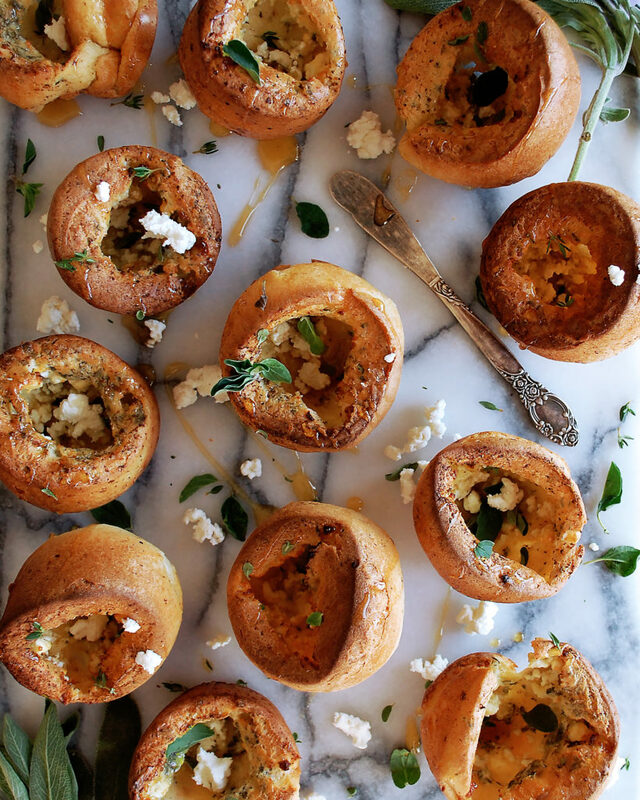 If not, and all you really want for the big game are cheesy dips (see this amazing Beer Braised Onion & Cheddar Dip), spicy wings, or buffalo anything… then save these popovers for your next dinner party! They make the perfect start to any meal. 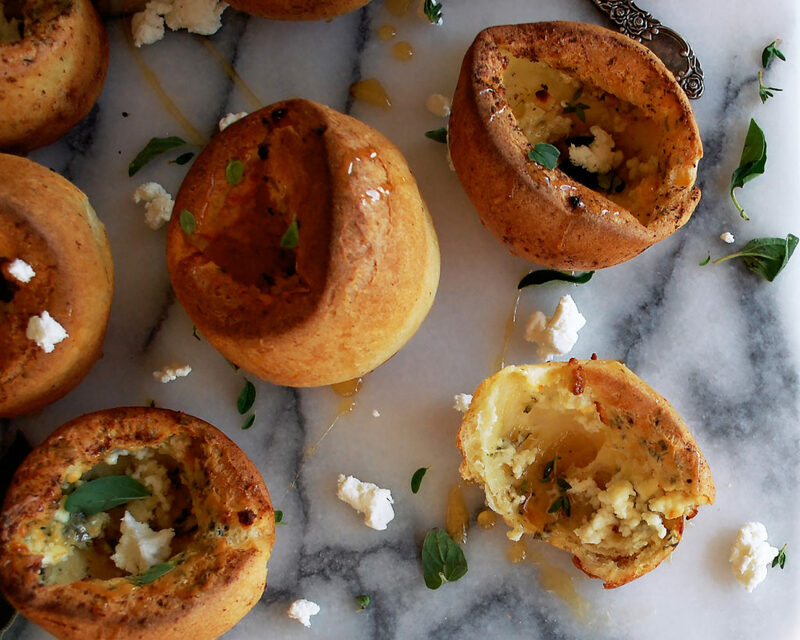 Okay, so the quick rundown is that you basically make the batter for the popovers in the blender (SO easy), pour it into a hot muffin tin, add some goat cheese, bake, and done! They really are so easy, yet intriguing enough where everyone will wonder how on earth you made them. I add lots of fresh herbs to the batter, and then the goat cheese is there for a nice tangy, cheesy bite. Once they come out of the oven, I drizzle them with honey which works so perfectly with the cheese. And the most crucial part? You definitely want to eat these fresh out the oven!! They will be crispy and airy, and won’t last too long. Preheat the oven to 425F. Melt the butter and let cool slightly. Pour 1 tablespoon of the butter into the container of a blender and set aside. With the remaining melted butter, pour about a teaspoon into each cup of a 12-cup muffin tin. To the blender, add the eggs, milk, sugar, and salt. Blend until smooth. Add the flour in three batches, blending as you go. Stir in the chopped fresh herbs. Place the muffin tin into the oven for 2 minutes. Remove the pan and pour the batter about halfway up each cup. Distribute the goat cheese evenly across each cup, placing the crumbles right into the batter. Bake the popovers for 15 minutes. Reduce the heat to 350F and finish cooking for another 15 minutes. Do not open the oven during this time. 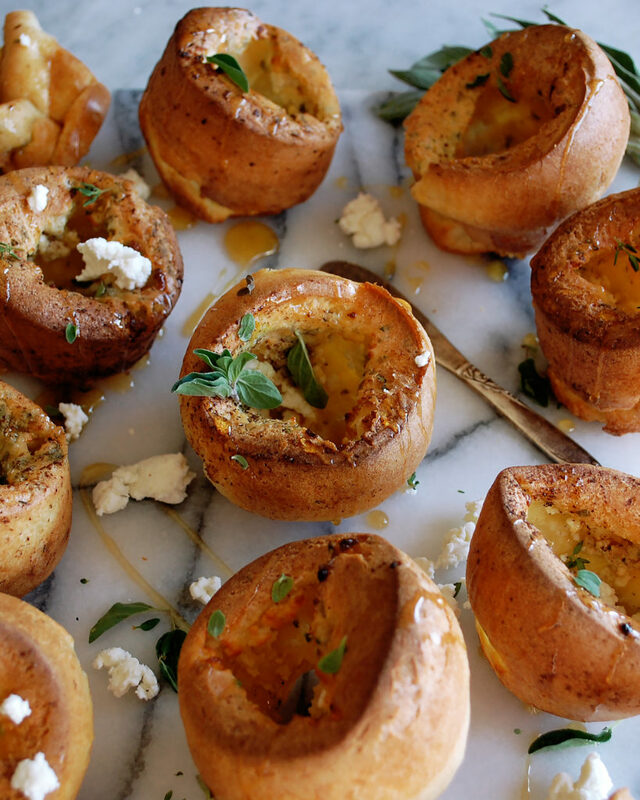 Remove the pan from the oven and transfer the popovers to a serving platter. 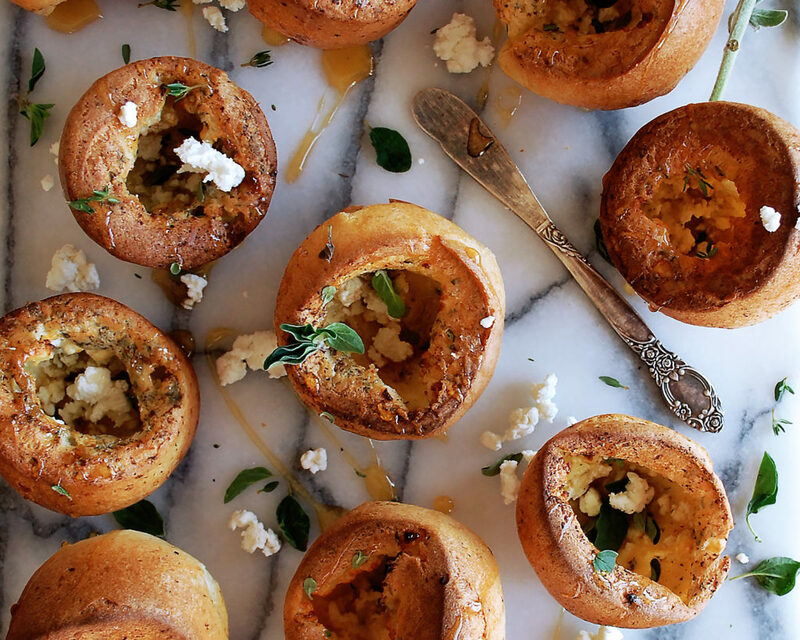 Drizzle the popovers with honey and a pinch more salt, if desired.